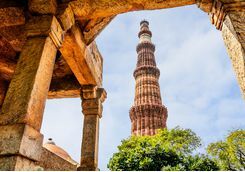 On an action packed two week trip to India experience the very best of the beautiful architecture - yes that does mean the Taj Mahal - the fantastic food, as well as the secret beaches and diving scene. 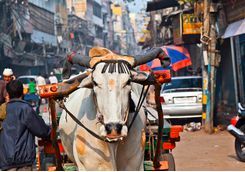 Beginning in Delhi this tour will take you on to Agra, Jaipur, rural Rajasthan, and then finish with some well-deserved R&R on Havelock Island in the Andaman Islands. 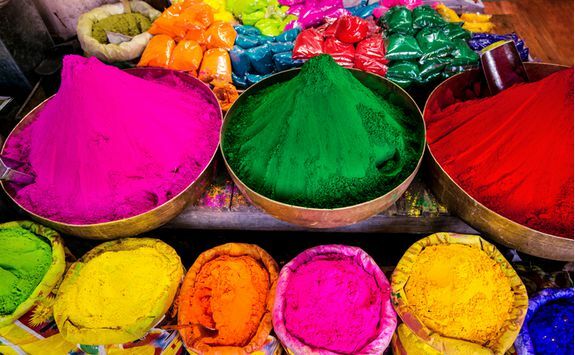 This combo would also make for a humdinger of a honeymoon in India. 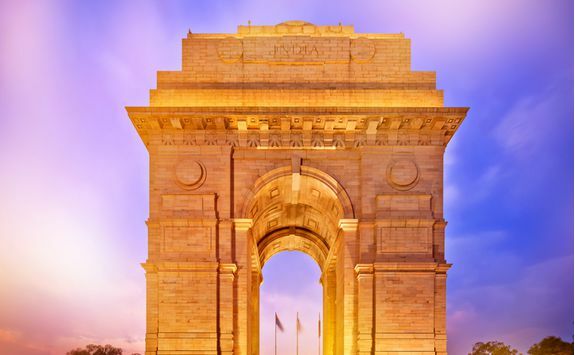 Your Indian adventure begins with an eight and a half hour night flight from the UK to the Indian capital Delhi. 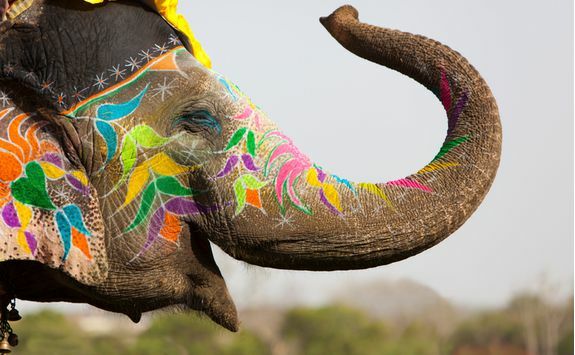 Your flight arrives into Indira Ghandi International Airport at breakfast time. 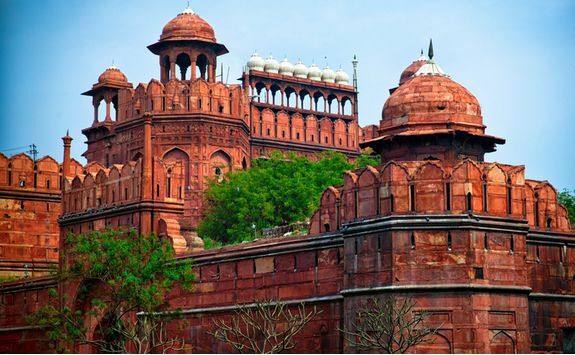 Once you've passed through customs and collected your luggage you will be met by your driver and transferred to your central Delhi hotel. Depending on which hotel you are staying at, this journey should take between 45 minutes and one hour. On arrival you can check in and then enjoy lunch at the hotel. 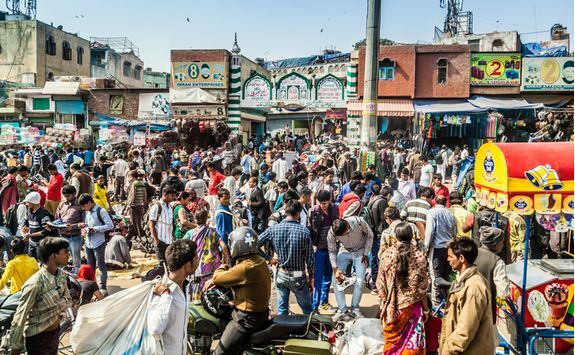 You then have the afternoon to either relax by the pool and adjust to life in India, or to explore this vibrant city, using our detailed Dossier to recommend the best places to eat, drink and shop. The Dossier will also come in useful for choosing a restaurant this evening, and we can make reservations to make sure you snaffle the best table in town. 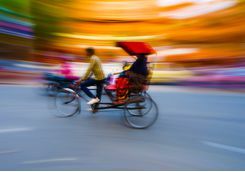 We think Delhi is an under-rated place, and particularly for first-timers we aim to show you why on a morning's private bicycle rickshaw tour. Your rickshaw driver/guide will cycle you through the winding alleys of the Old Delhi markets where you can witness bustling life up close as street barbers shave their clients and stall keepers sell their colourful garments and spices. Hop off whenever you want a closer look, and return to the hotel in time for lunch. 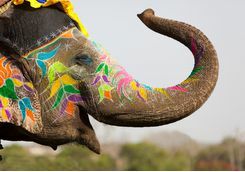 This afternoon you can relax, or we can arrange any of a number of other exclusive experiences as detailed below. 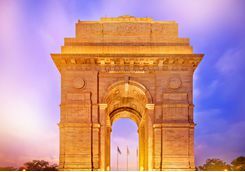 We can again reserve a table in one of the finest restaurants in the city, or you can enjoy a final meal in Delhi at your hotel. 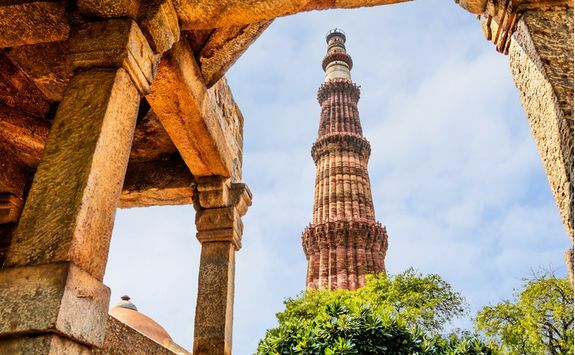 Qutab Minar tour - the 72.5 meter high tower dating back to the 13th century, and Humayun's Tomb, which was built in the 16th century and architecturally considered the forerunner of the Taj Mahal. 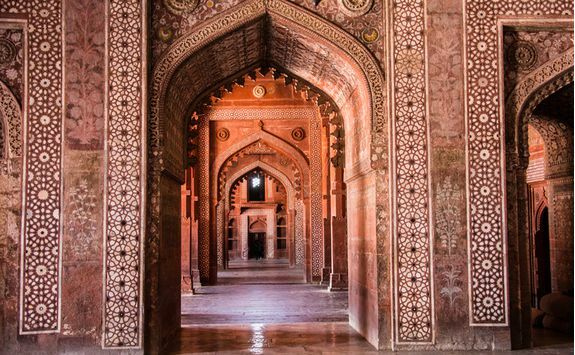 After an early breakfast this morning you will be transferred to Hazrat Nizamuddin station in Delhi and ushered on board the Gatimaan Express train to Agra. 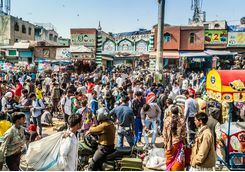 The train leaves at around eight in the morning and arrives into Agra about an hour and 40 minutes later. You will be met on arrival into Agra and taken by your driver/guide for an introductory tour of the city, and to see the buildings other than the Taj that make Agra such an interesting destination. 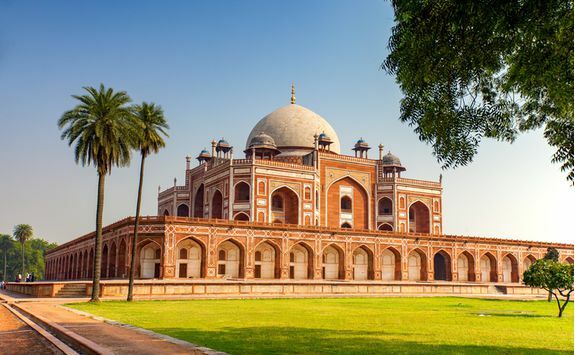 Start with the so-called 'Baby Taj', the Itmad-ud-Daulah, which was the first Mughal building built entirely from marble, and consequently a fascinating forerunner to the Taj itself. Next, visit Agra Fort, a UNESCO World Heritage Site that is effectively a walled city within a city, built of red sandstone and the long-time seat of the Mughal emperors. By now it will be time for you to check in to your hotel, and enjoy a lovely lunch there before an afternoon to relax after your early start. 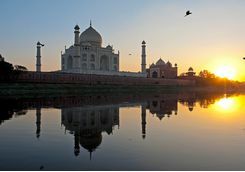 In the evening, we have arranged for a driver to take you across the Yamuna River to a special viewing spot where you can gaze across at the Taj Mahal reflected in the water as the sun sets and the white marble turns slowly red. Afterwards you can eat at your hotel, or we can recommend another restaurant in the city. 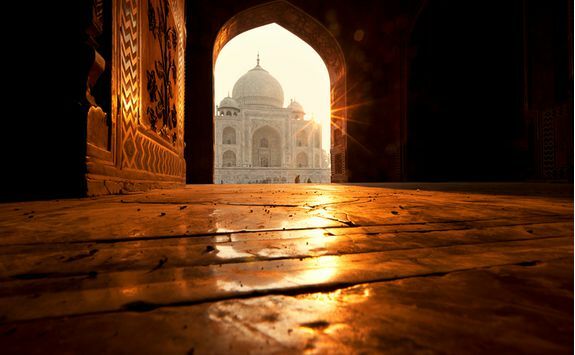 So you've seen a precursor to the greatest building on the planet (discuss) and then the Taj itself from afar, but this morning it's time to see the main event up close as your driver/guide takes you to the Taj Mahal. In the office we're pretty much unanimously agreed that this is somewhere that really doesn't disappoint. It's another early start, though, because you'll want to appreciate this magical place at what photographers call 'the golden hour' - either sunrise or sunset - and before the hordes of tourists arrive. 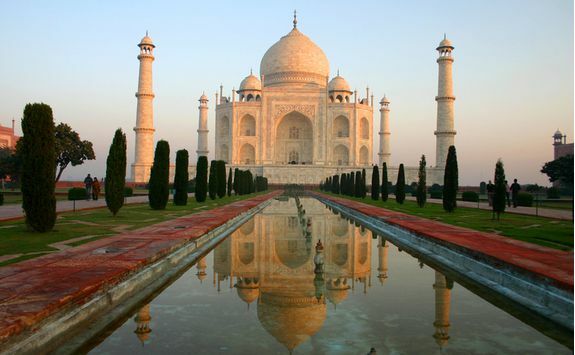 It's worth spending an hour or so to appreciate the perfect symmetry, the view from the gardens, the extraordinary detail when you get up close and to soak up the completely romantic story surrounding the Taj Mahal's creation. For lovebirds on honeymoon, there really is no more perfect monument to love than the Taj. 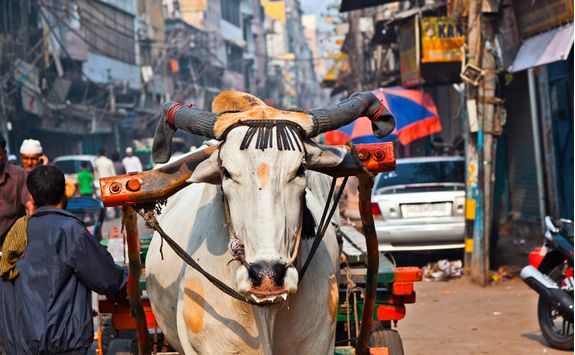 Dragging yourselves away, it's off for the five hour drive to Jaipur. 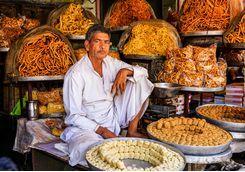 Gazing out of the window you'll appreciate the beauty of Rajasthan's rural areas, where the muted colours of the fields and hills are suddenly enhanced by a flash of vivid colour from a woman's sari or the almost luminous colour of a farmer's turban. 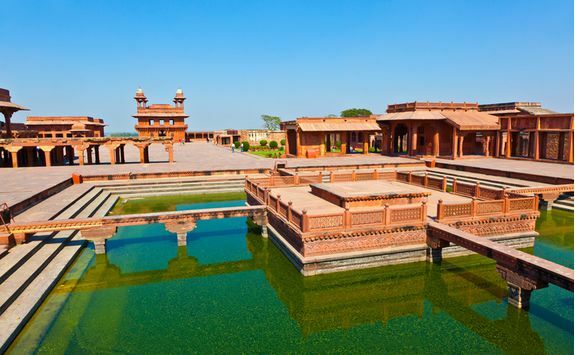 On route you will stop at Fatephur Sikri, the deserted and almost perfectly preserved city that briefly served as the Mughal capital before a spring that provided the city's water dried up and the site was abandoned. 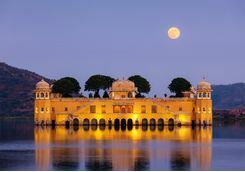 On arrival into Jaipur, check in to your hotel and enjoy the evening. 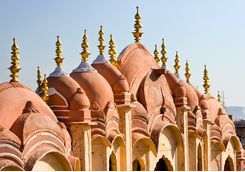 Today you can explore Jaipur in more depth with your guide on a private walking tour of the city. 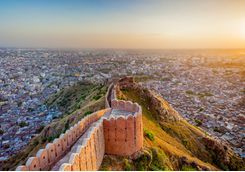 Jaipur is known as the Pink City, and is home to some of the best-known buildings in Rajasthan, including the City Palace, your first stop, and where the current Maharajah still has quarters. 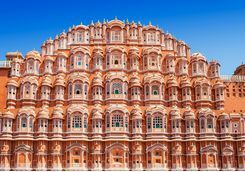 This is also the location of the Hawa Mahal or Palace of the Winds. 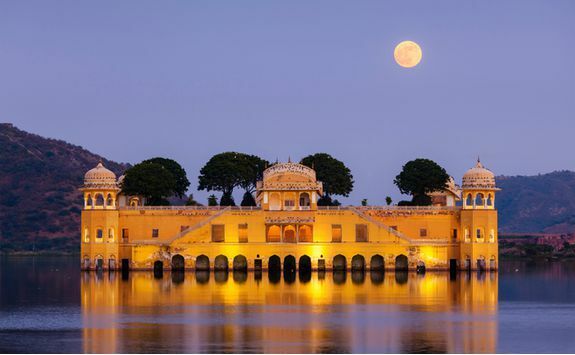 Original built in 1799, this elaborately decorated 'palace' is really a façade that allowed ladies from the royal household to get a flavour for life in the city beyond the palace without being seen. 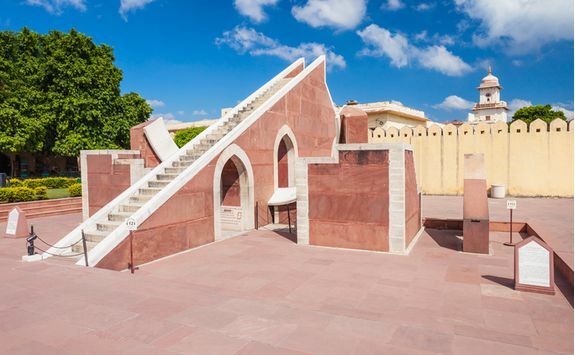 You will also visit the extraordinary Jantar Mantar, an area of eccentrically shaped buildings once used by an 18th century Rajput King for his astrological studies, at a time when many important decisions were predicated on astrology signs. 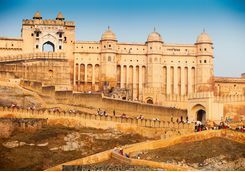 Your guide will explain what each of the buildings was designed for in this truly original UNESCO World Heritage Site. 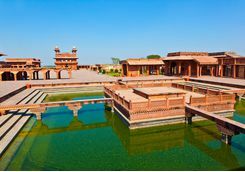 A fascinating day finishes with a wander through the bustling bazaar with the possibility to visit an ancient akhara, or traditional gym, where you can watch young men learning Indian wrestling or sword fighting; or visit various jewellers in a city famed for its gemstones. 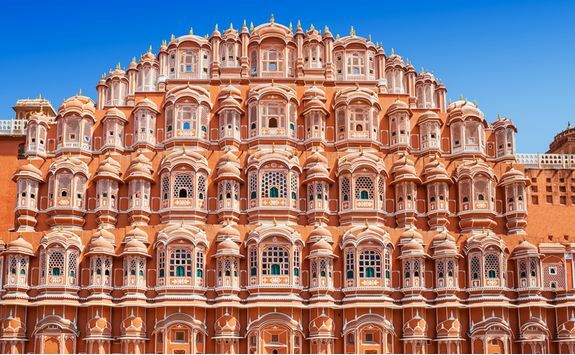 Our Dossier might come in useful again this evening if you want to eat out of your hotel at a restaurant or one of the other fine hotels in Jaipur. 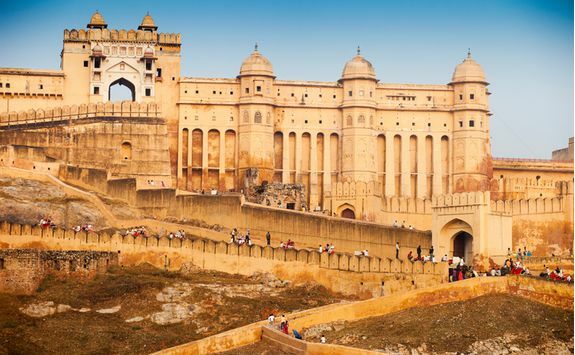 This morning after breakfast your driver and guide will meet you at the hotel for the fifteen minute drive to Amber Fort, one of the finest of Rajasthan's historic hill forts. 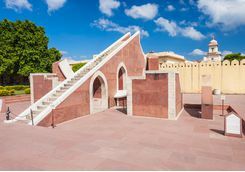 Explore the various levels and courtyards while your private guide explains about the fort's fascinating history dating back to the 12th Century. 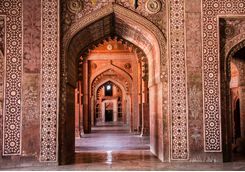 The sandstone and marble fort is filled with beautiful examples of Hindu architecture, especially in the zenana, or women's quarters. 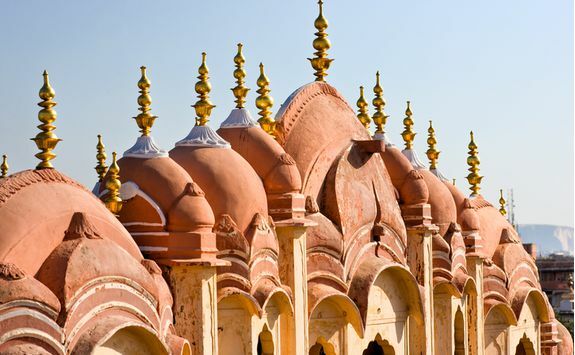 After a morning tour you will be transferred back to your hotel in time for lunch and this afternoon is yours to relax or choose another of the exclusive activities and experiences we offer in the Rajasthani capital. 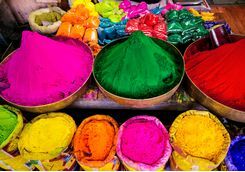 This evening we have arranged a private cooking course where you can learn about the key ingredients to Rajasthani curries and make one yourself. 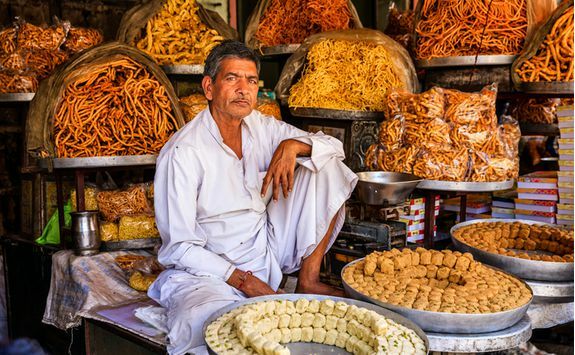 Start by visiting a local market to buy fresh ingredients while your chef and guide explains the different spices, then you'll be taken to their house for a hands-on cooking lesson with the family, before dining with them - a perfect finale to your stay in Rajasthan. 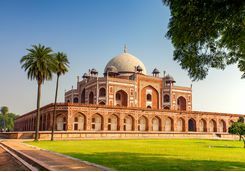 This morning you will have a relaxed breakfast and time for one more quick shop or wander around the city before you are met at the hotel for the five-hour private transfer back to Delhi. 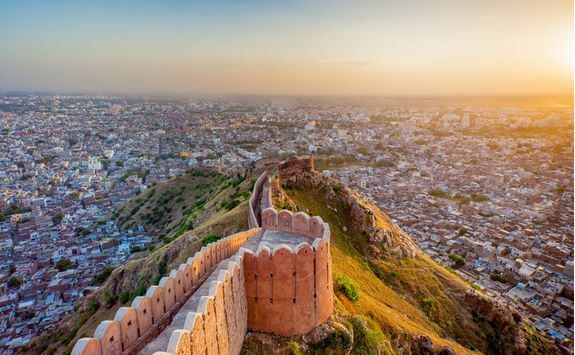 There are several places to stop and stretch your legs on route and a lovely fort where you can enjoy a delicious lunch. You will be back in the capital at around teatime, for one final night here. It’s an early start in the morning for the next leg of the trip, so we’d recommend an early night. 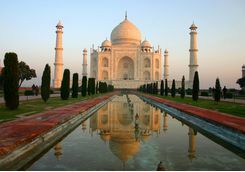 This morning you will be transferred to Indira Ghandi International Airport for the flight to Chennai, which takes two and half hours. 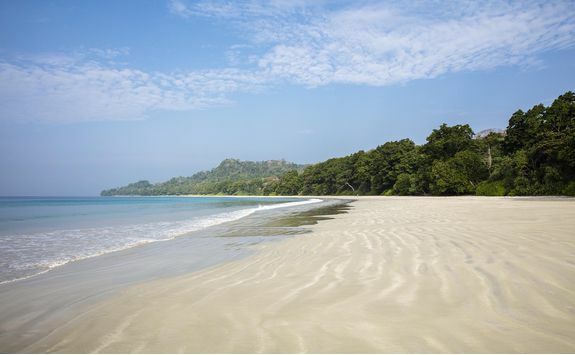 There's a short layover and your bags are checked on through to Port Blair as you transit to the connecting flight. 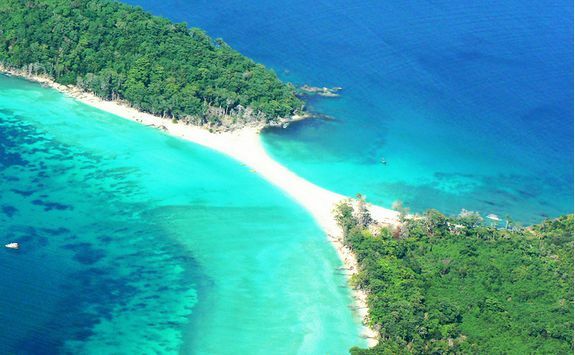 The flight to Port Blair takes an additional two hours and you'll arrive into the Andaman capital at around noon. 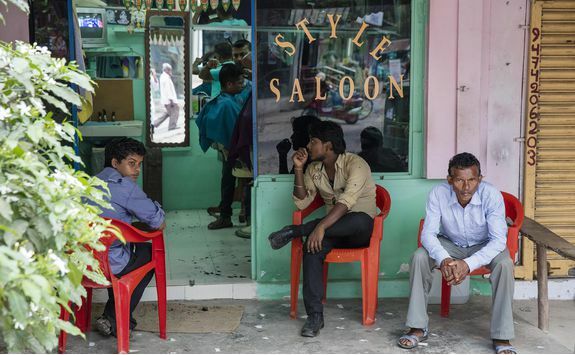 Here you will be met at the airport for the short drive to the jetty and the two-hour ferry to Havelock Island - your final (and heavenly) destination. 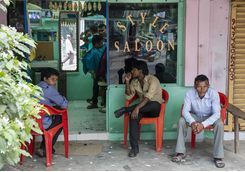 It's been a multi-legged trip to get here, but Havelock has some of the finest beaches in India and a wonderful laidback vibe, whichever of our hotel choices you plump for. 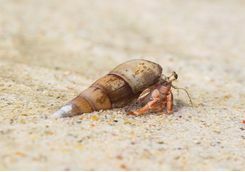 For divers we can also arrange for a stay aboard a luxury liveaboard boat, so you can get out to explore the pristine reefs surrounding some of the farther flung of the 572 Andaman Islands. 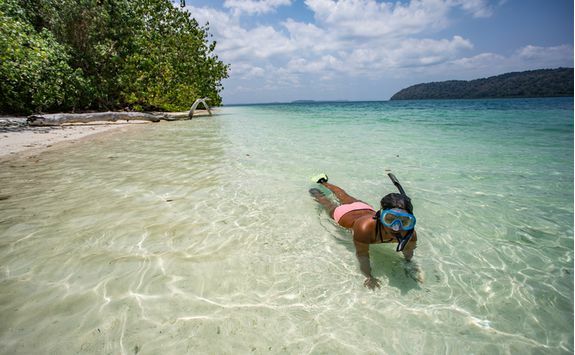 Whichever of the hotels we've recommended to best suit you and your budget, you can now settle in to a few days of blissful R&R on Havelock Island. Both Barefoot at Havelock and Jalakara have spas and can arrange a range of treatments, including massages and rejuvenating yoga sessions. Spas aside, you're likely here to hit the beach, and luckily there are plenty to choose from. 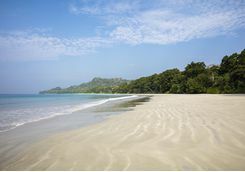 The most famous beach on Havelock is Beach Number Seven, more romantically known as Radhanagar Beach. You can spend a few delicious days here, but we strongly recommend spreading your wings to explore the rest of the island. 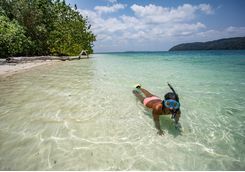 You can borrow snorkelling equipment to see the reefs off Elephant and Turtle Beaches, but we can also arrange longer boat trips to snorkel or swim in the waters around the islands of the Rani Jhansi Marine National Park. Other aquatic pursuits include sea kayaking and big game fishing trips for the likes of tuna and giant trevally. 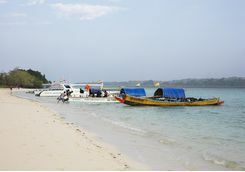 And then, of course, there's the diving, which is excellent and which we can also arrange and prebook for you. 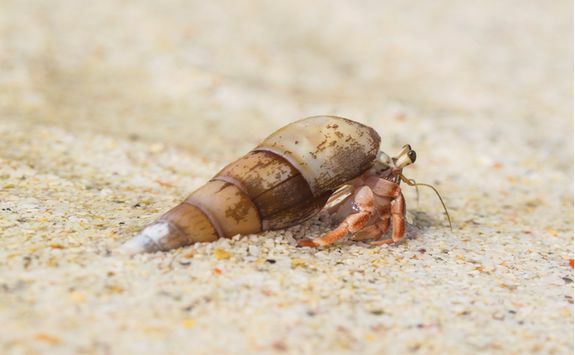 For landlubbers, we can arrange guided nature walks to explore the beautiful natural surroundings and spot the abundant local flora and fauna. Enjoy dinners at your hotel or in some of the smaller places on Beach Number Five – we’ll recommend the best. 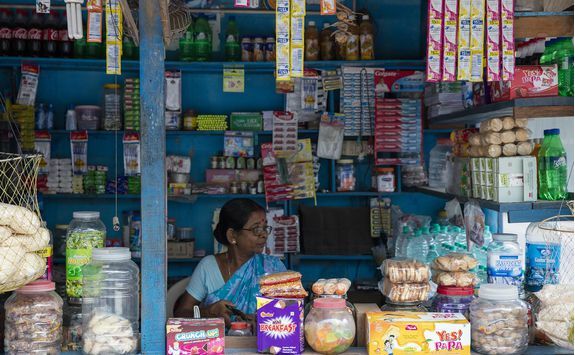 There's one last breakfast to savour on Havelock before you've had your lot. 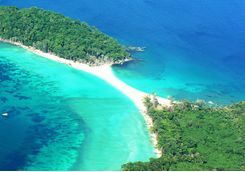 You'll be transferred via the return ferry to Port Blair in time to check in for the flight back to Chennai, which takes two hours. From there you will be met and transferred to your hotel. Tomorrow morning is a very early start so we recommend an early night. 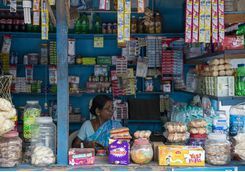 sadly it's time to head home and after a very early morning wake up call, you will be transferred back to Chennai International Airport for the direct flight back to the UK, leaving in the early hours of morning and taking ten and half hours.